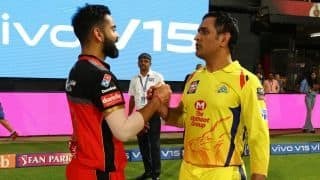 Kings XI Punjab claimed their fifth win of IPL 2019 with a 12-run win over Rajasthan Royals in Match 32 of the league at the PCA IS Bindra Stadium on Tuesday, despite Stuart Binny's late blitz off 31 not out off 11 balls. Chasing 183 to win, Rajasthan managed 168/7. 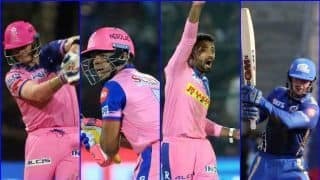 Kings XI Punjab claimed their fifth win of IPL 2019 with a 12-run win over Rajasthan Royals in Match 32 of the league at the PCA IS Bindra Stadium on Tuesday, despite Stuart Binny‘s late blitz off 31 not out off 11 balls. Chasing 183 to win, Rajasthan managed 170/7. 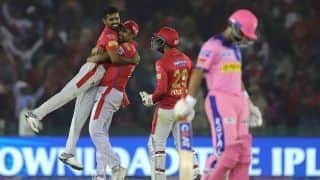 KL Rahul‘s 52 off 47 balls and David Miller‘s 40 off 27 balls set base for a big KXIP total, before Ravichandran Ashwin‘s 4-ball 17 pushed KXIP further. In defence, skipper Ashwin led from the front with 2/24 in his four overs. Debutant Arshdeep Singh claimed 2/43 in his four overs, while Mohammad Shami returned 2/44. 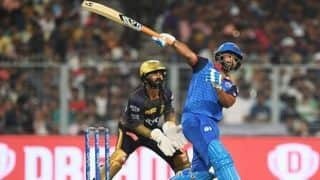 Rajasthan were off to a good start with Jos Buttler and newly-promoted opener Rahul Tripathi adding 38 runs in just 4.1 over before Buttler was undone by a slower one from debutant Arshdeep. Sanju Samson and Triapthi then drove the visitors with a stand of 59 runs for the second wicket in just 7.3 overs. 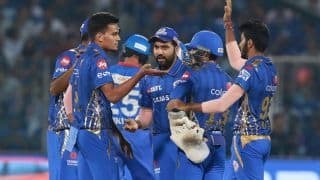 But Samson’s wicket, taken by Punjab skipper Ashwin proved to be the game-changer as Rajasthan lost way in the middle after that. 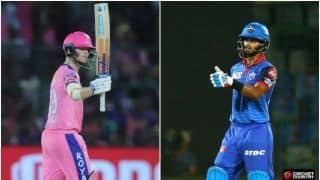 Rajasthan skipper Ajinkya Rahane, coming down the order, at No.4 in place of a dropped Steve Smith failed to maintain the early momentum. By the time Tripathi got out, caught by Mayank Agarwal off R Ashwin, Rajasthan had 66 runs to win off just 24 balls. With the asking rate over 11 runs per over, Big-hitters Ashton Turner and Jofra Archer, perished – going for the the big hits. 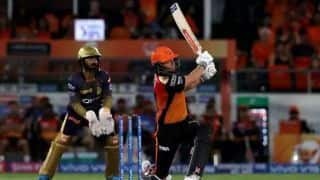 Turner’s IPL debut turned out to be dud as he departed for a first ball duck off Murugan Ashwin. Archer was taken at long-off by Rahul off Shami for one for three. Binny then got a four and six off Shami but Rahane struggled to get going, eventually falling to debutat Arshdeep for 26 off 21 balls. Earlier, after being put into bat, Punjab were off to a good start with Gayle and Rahul adding 38 runs in 5.4 overs. Gayle hit three sixes and two fours en route to 30 off 22 balls before falling to Archer, caught behind by Sanju Samson. Punjab slowed down a bit in the middle overs, with Rahul tied down despite a handy cameo from Mayank Agarwal. He scored 26 of f 12 before falling to the leg spin of Ish Sodhi. Miller and Rahul then played out a dull passage of play before upping the ante. Rahul was third to depart with the score at 152 in the 18th over. 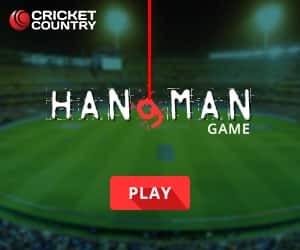 He went for 52 caught at backward point off Jaydev Unadkat. 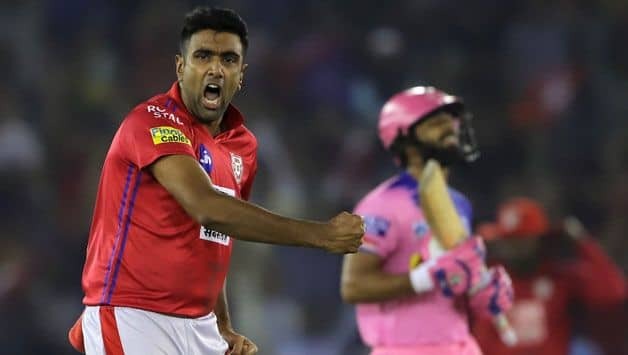 Rajasthan got back in to the game with quick wickets as Nicolas Pooran (5) and Mandeep Singh fell to Archer, but a 4-ball 17-run cameo from skipper Ashwin helped Kings XI Punjab to finish well at 182/6. Dhawal Kulkarni‘s final over went for 18 runs with Ashwin taking two fours and a six off Kulkarni. Archer finished with good figures of 3/15 in his four overs, while Kulkarni, Unadkat and Sodhi picked one wicket apiece. Both teams made three changes with debuts for pacer Arshdeep (KXIP) and Turner (RR). Sodhi and Binny got a game for RR while KXIP got in Miller and Mujeeb. 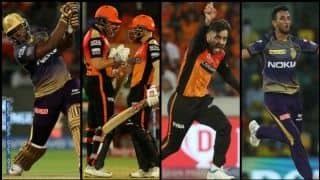 Brief Scores: Kings XI Punjab 182/6 (KL Rahul 42, David Miller 40; Jofra Archer 3/15) beat Rajasthan Royals 168/7 (Rahul Tripathi 50, Stuart Binny 31*; R Ashwin 2/24) by 12 runs.